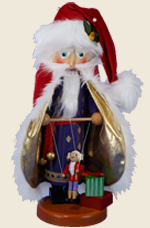 The first nutcracker to premiere into the Steinbach 12 Days of Christmas Nutcracker Series was, of course, the Pear Tree Santa Nutcracker (ES1881). This nutcracker sure sent the collectors singing. This musical nutcracker plays the classic tune of his namesake. 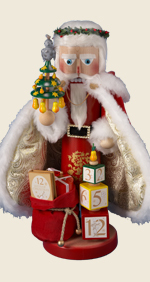 With a simple turn of the key he invites all around to sing the well-known tune of “Twelve Days of Christmas.” At 17" tall, the Pear Tree Santa Nutcracker is a limited edition of 5,000 pieces. 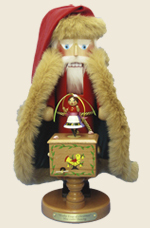 2006 brought about Part Three in the Steinbach 12 Days of Christmas Nutcracker Series (ES1883). 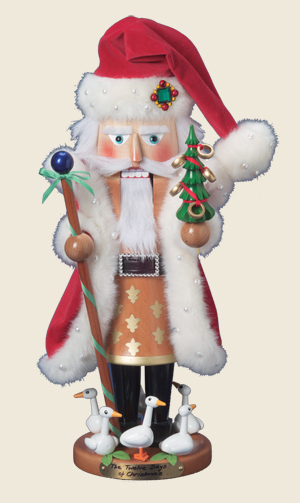 This nutcracker is adorned with red velvet and white fur with pearls on his coat. In his hand he holds a green Christmas tree with five golden rings on it. At his feet are six laying geese. This nutcracker was a limited edition nutcracker of 7,500 pieces. Like the others in this nutcracker series, Part Three of the 12 Days of Christmas Series plays the beloved song the "Twelve Days of Christmas". 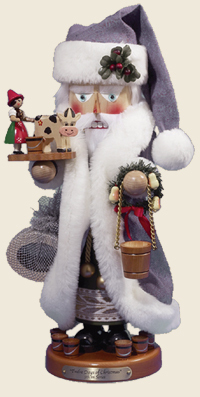 The next year, 2008, Steinbach proudly introduced the Eight Maids a Milking Nutcracker, Part five of the 12 Days of Christmas Nutcracker Series. This musical nutcracker plays the “Twelve Days of Christmas” song. His lavender coat and hat are made of velvet and fur. This nutcracker wears a wreath on one wrist and holly leaves on his stocking hat. With milk buckets in each hand and surrounding his feet, he stands at 18” tall and is a limited edition of 7,500 pieces. There are also a limited number of pieces signed by Karla Steinbach (ES1885SIG). In 2009, Steinbach introduced the Nine Ladies Dancing Musical nutcracker, Sixth in the 12 Days of Christmas Series (ES1886). This nutcrackers has on a green coat and a red hat with brown trim. He holds a music box with a tiny lady dancer on top. This nutcracker is 18 inches tall and is a limited edition of 7,500 pieces. There is also a limited amount of nutcrackers signed by Karla Steinbach (ES1886SIG). 2010 brought about the release of the Seventh nutcracker in the 12 Days of Christmas Series; "Ten Lords a Leaping" (ES1887). This nutcracker is wearing a red cape with metallic gold lining. 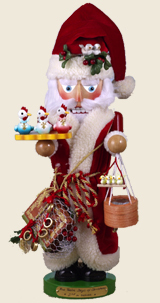 In his hands he holds one of the "10 Lords a Leaping" and there are Christmas packages at his feet. This piece is a limited edition of 4,000 pieces. 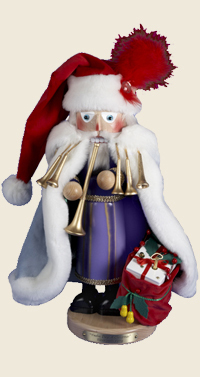 In 2011, Steinbach introduced the Eighth nutcracker in the 12 Days of Christmas Series (ES1888) "Eleven Pipers Piping" Nutcracker. 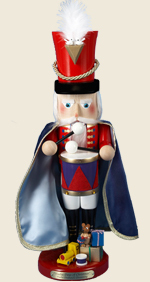 This nutcracker has on a blue coat and a red hat with white fur trim. He has pipes at his collar and a bag of gifts at his feet. 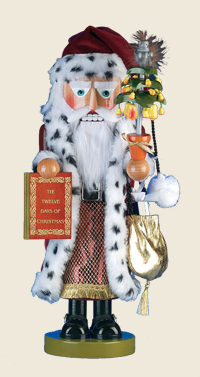 This nutcracker stands at 18 inches tall and is a limited edition of 4,000 pieces. There is also a limited amount of nutcrackers signed by Karla Steinbach (ES1888SIG). Steinbach’s 12 Days of Christmas series continued in 2012 with the 9th piece, “Twelve Drummers Drumming,” (ES1940) a limited edition of 5,000 pieces. Representing the twelfth part of one of the most beloved Christmas carols, this nutcracker stands at 19” tall and is dressed as a classic drummer, complete with drum and two sticks. He plays the Christmas tune, "The Twelve Days of Christmas." Like all of Steinbach's creations, he is hand-crafted in Germany with the finest care and attention to detail. Steinbach’s 12 Days of Christmas series has reached its completion with the 10th and final piece, which incorporates elements of all previous pieces’ designs. 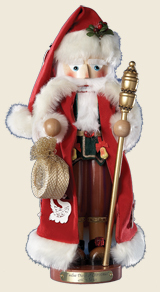 Wearing a rich red robe lined with gold and trimmed in faux fur, this nutcracker stands at 17” tall and is a limited edition of 5,000 pieces.